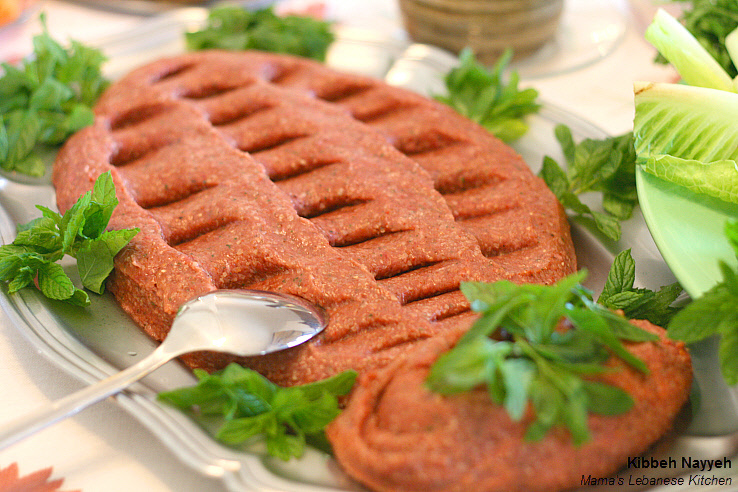 Kibbe Nayyeh stands for “raw Kibbe”, Kibbe being the patties made from ground meat, burghul (cracked weat) and spices. 1. Freeze the meat for 2 weeks if possible, in order to age it and to help eliminating any typical raw meat contamination. When ready to prepare the dish, place the frozen meat in the fridge for 2-3 hours to thaw it half way. 2. When the meat is halfway thawed, place it in a food processor along with about 5 cubes of ice, 1/5 teaspoon of ground cinnamon (no more) and spin it for about 3-5 minutes until it becomes very fine. Important: stop the food processor every 1 minute or so and feel the temperature of the meat and make sure it’s not warming up otherwise its color and taste would change. If you feel that it’s warming up, add a bit more ice or 1/4 cup of icy water and spin again. 3. Place the Burghul in a small bowl and rinse it with cold water, then squeeze it to get rid of as much water as possible. Place it aside. 4. Put the green pepper, mint, marjoram, onion, salt, cayenne pepper and 7-spices in the food processor and mix them well. 5. Place the ground meat in a large bowl, add the wet Burghul and the spice mix, and mix it well with your hands for a few minutes to make sure that all ingredients have well infused in one another. While mixing it, you can wet your hands every now and then in bowl of icy water that has a tiny bit of ground cinnamon in it. 1. Kibbe Nayyeh needs to be served cold, so you need to keep the dish in the fridge until serving time. 2. When ready, make the Kibbe mix into balls the size of a baseball and line them up along your serving dish. 3. Spread the kibbe on the dish with your hands or spoon, until it’s no more than 3/4 inch thick. Make some patterns on it if you wish. 4. Add tons of high quality olive oil on it. Serve with optional sides including: mint, radish, green peppers, green chilli peppers, hot peppers, green onions, white onions etc. 5. Kibbe Nayyeh can be eaten with a fork or wrapped in pita bread. 6. We hope you enjoyed this recipe, and you now learned how to make Kibbe Nayyeh like a pro 🙂 We’d love to get your feedback and comments on it.